With summer here, it is time to reach for the sunscreen; drink fluids to stay hydrated; and to pay attention to heat wave warnings. Below we discuss the importance of these summer hazards. HEALTH AND WELLNESS: Protect your skin from the sun. Daily sunscreen is important to protect us from skin cancer and sunburn. The sun also accelerates the signs of aging so sunscreen helps in that arena as well. It is important to know the difference between sunscreens. The sun’s radiation includes both ultraviolet A (UVA) rays which raise the risk of skin cancer, and ultraviolet B (UVB) rays, which cause sunburn. SPF measures how much UVB radiation is blocked. Levels range from 2 to more than 70. When a label claims it prevents sunburns it is blocking UVB. 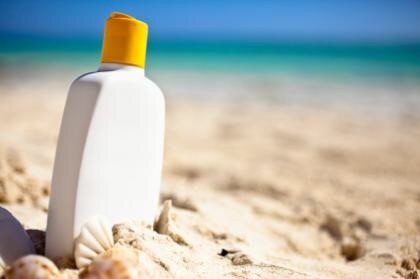 When a label promises the sunscreen can prevent skin cancer, it has passed tests that protect your skin from both UVA and UVB. Labels have really made a difference and educated a lot of people. When you go outside for an extend period, use a water-resistant sunscreen of SPF of at least 30 and make sure to cover your ears, nose, the back of your neck, and all exposed areas. Clothing is helpful as well when it has sun protection built right in. UPF of 40 or more is best. Remember to protect your eyes with sunglasses that block UVA and UVB rays, too. Drinking fluids is crucial to staying healthy and maintaining the function of every system in your body, including your heart, brain, and muscles. Warning signs of dehydration include weakness, low blood pressure, dizziness, confusion, or urine that is dark in color. To ward off dehydration, healthy people should get 30 to 50 ounces of water per day, but not all at once. The kidneys lose some ability to eliminate water as we age so it is important to stay hydrated gradually throughout the day. Pay attention to heat wave warnings this summer. If your weather forecaster warns about a heat wave this summer, take it seriously. A study by Harvard researchers found that some people are at an increased risk of winding up in the hospital during periods of high heat. How to prepare? Stay out of the heat, stay hydrated, and make sure you have an air conditioner that works. FITNESS: The chair stand: This exercise works your abdominal and leg muscles. It can de done from any stable, non-rolling chair in your home or office. Sit in a chair with your feet hip- wide apart. Place your hands on your thighs. Tighten your abdominal muscles and buttocks. Exhale as you slowly stand up. Inhale as you sit down slowly, with control. Repeat this eight times.